It’s an alarm that doesn’t sound good in any language or accent. And at 1.30am, when Tom the Finn found he was being bitten, he didn’t hesitate to share his horror. He issued the chilling warning, shook his sleeping bag and flashed his torch beam around the room while he inspected every bed for a bug-free place to lay his head. The snorers slept through the drama, of course, but everyone else immediately imagined an infestation that might or might not be real. And that was an end to rest for another night. So we were a weary-looking bunch as we set off down the road from Rubiães in the morning. 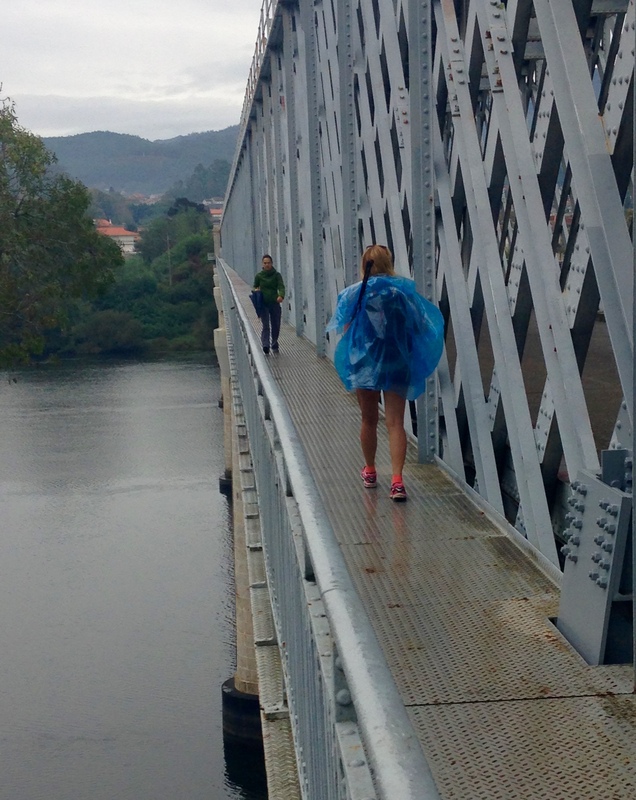 It was the first rainy day in a week and some people left protected in full waterproofs, but the rain was warm and gentle and I walked happily in shorts the 20km to Valença, the last city in Portugal. The arrows directed us through the narrow cobbled streets and up into the fortress which dominates the town then finally out through dark, mysterious passages and back into the light. 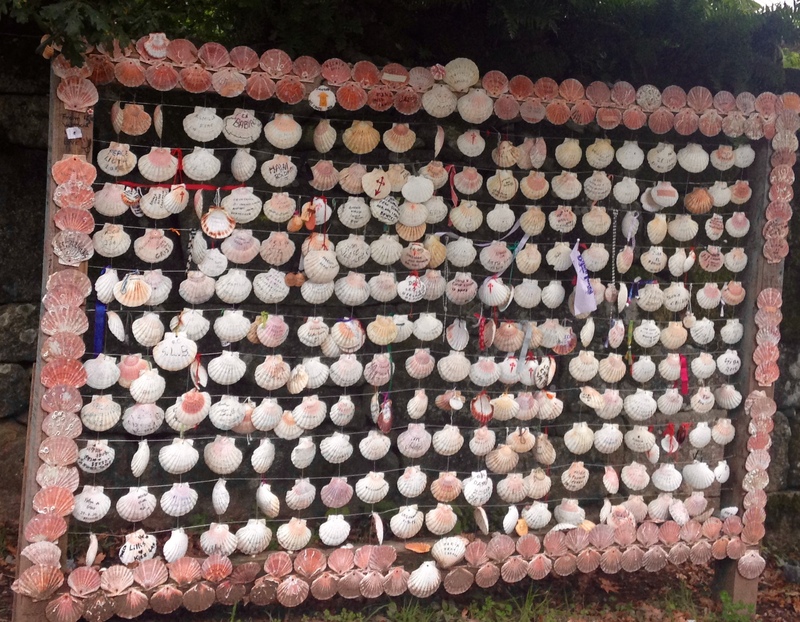 A metaphor for the camino, perhaps? We crossed the Rio Minho on the edge of the high, long rail-road bridge, And entered Spain. Rattling the doors of the tourist Information centre proved pointless. It was frustrating because our watches told us it should be open and we needed … information! Eventually we gave up and we wandered off to find our own way around town, all the while muttering about extended siestas. Only when we were sitting in a bar with tapas and vino tinto did we remember the time change between the countries, and by then we were comfortably settled in an albergue with sheets and duvets – and I had a top bunk against a wall. Perfecto. The Quebecois girls turned up late after moving hostels when they discovered the Portuguese Snorer was in their room. Word was getting around. I wonder if he’ll realise there’s a problem when he has a whole dorm to himself by the end of his camino? It feels good to be back in Spain though. We’re now half way to Santiago. So were the bedbugs in that guy’s head rather than in his bunk? I hope so. That would be an aspect of Caminoing that I would not care for. No, they were in his bed and on his skin. We saw the bites. And he wasn’t the only one. A German friend was covered in bites and stopped using albergues from that point on. It’s ghastly. Makes me wish I’d taken my tent! Yup. I’d be for fewer miles per day and my own sleeping bag, pad and shelter. That would wreck the whole journey. Hope you manage to avoid them. I’m hearing an awful lot about bed bugs right now. Maybe they have been gathering force throughout the warmer weather. I was bitten once on the Mozárabe (VdlP) and didn’t hear about any other problems during 52 days walking – but that was in April/May. We’re the bugs at the municipal albergue or a private place? I felt quite a shock when I saw that ‘España’ sign – I didn’t really want to be leaving Portugal. They seemed to be everywhere! People were certainly bitten in the Escola muni albergue in Rubiães. I saw the evidence. Unfortunately. It really is the most unpleasant part of the camino. Halfway. You’re making good progress in spite of the bugs.